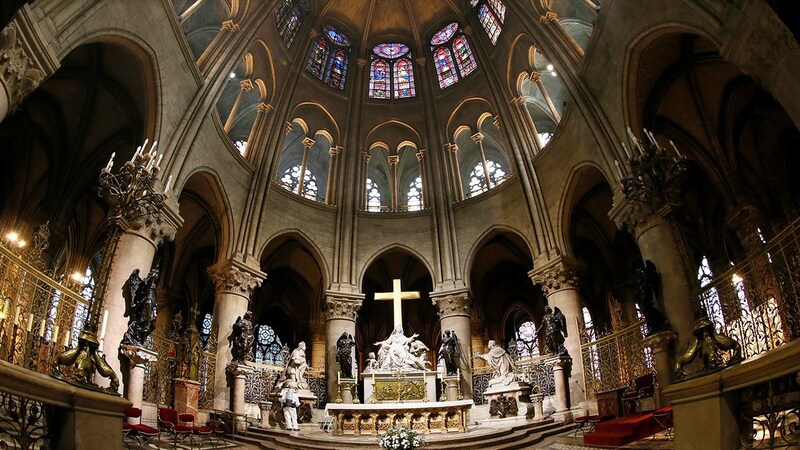 Reformers’ thoughts on Notre Dame? Do you think this article gives an accurate assessment of what the Reformers, specifically Calvin, would have thought about the burning of the Notre Dame Cathredal? If transported in time, Calvin would have been shocked to have seen one of the devil’s castles in ashes and then find Reformed Protestants mumbling about how beautiful it used to be. First of all, I don’t care for the article. “Albert Mohler is signaling a virtue…” The whole article is virtue signaling. There are reasons to disagree with Mohler, but this seems petty. Second, Mohler loves history. Maybe everyone doesn’t love history as much as he does such that they mourn the loss of this icon of the medieval times but Dr Mohler certainly does. He’s not virtue signaling with his statement that he is saddened by the partial destruction of Notre Dame. He, at least, is authentic. I wonder if the writer of the article (is he even identified?) is as authentic as he reminisces his high school memories scoffing at Notre Dame. Third, it’s not as though the point of the article is that John Calvin would be so, so sad right now… There’s one sentence. Mostly the article laments France’s general national movement away from Christianity and toward the world. That’s something Calvin would lament. He would probably not recognize modern France. In that respect, I’d say Mohler is right. Calvin would be sad to see his native country so far removed from the gospel and that removal symbolized in this way. Is the article right that his hatred if Catholicism was so deep that he would not mind seeing Notre Dame burn? I don’t know. But I’m certain Mohler has read more Calvin than me (and the ?anonymous? writer) and I wouldn’t challenge him on it without clearer evidence than is given. It seems like a poor argument to make. What does it gain even if absolutely true. Why argue with Mohler on this issue? I’m sympathetic, Nathan, but (and I say this without having read either article) I do think it quite clear that the reformers would have been shocked at the reformed world’s fall into the love of riches and the extent to which such churches are for the wealthy today. The big cathedrals were funded by selling indulgences. However, it burning today means something very different than it would have meant 500 years ago. And the Reformers would have recognized that. However, it burning today means something very different than it would have meant 500 years ago. Agreed. Both Mohler’s article and the Pulpit and Pen article are silly. Calvin hadn’t the faintest idea what would transpire in the four centuries or so since his death, and speculation about what he would have thought about something like this is silly. I mean, honestly, it’s like they think Notre Dame’s next act will be as a Protestant church instead of the vastly more likely choices: Hagia Sofia II or an art museum displaying the ugly profanities that get labeled “art” in our decadent time. I skimmed some news articles on this today. As I read about the millions of euros being put forth by donors, and all the sentimentality being expressed by the unbelieving world, all I kept coming back to in my mind was to see this as a parable. This cathedral represents everything that the western world wants Christianity to be – namely, a hollow shell, beautiful and benign, maintained for the sake of sentimentality, but irrelevant to our actual lives. This cathedral represents sentimental Christianity. People will always fight to maintain the sentimental Christianity, because the feeling of sentiment is the thing they prize. They don’t want the substance. Sentimental Christianity provides us with an outlet to assuage the conscience without the need for actual repentance and new birth. Interestingly, I was reading 2 Samuel 7 to my children tonight, discussing how David desired to built a house for God. In response, God rebuked him lightly. “Did I ever say to any of you, ‘Why have you not built me a house of cedar?’” (2 Samuel 7:7). Instead of receiving a house from David, God instead tells David he is going to build David a house – a house which shall be established forever (2 Samuel 7:11-12). It is this house that really matters. Though Solomon would go on to build a temple for the Lord, history would come to demonstrate that every building built by human hands will fall. But the true house of God is built of living stones, not of wood and rock (1 Peter 2:5). The earthly temple was but a foreshadow of the substance that was to come. So my response to this whole Notre Dame thing is basically… who cares? Let the unbelieving world maintain their sentimental Christian icons if they wish. Let them throw millions and millions of dollars at it. But cathedrals have never had anything to do with the church. Hagia Sofia II or an art museum displaying the ugly profanities that get labeled “art” in our decadent time. If I were a wagering man, this is where I’d bet a bundle. Yes, and one of the questions is whether France’s aggressive secularism will eat the sort of holes in Muslim commitment that modernity and now post-modernity have done to Christianity in Europe since the First World War. In the UK, the Muslim politician who is now Mayor of London voted for gay marriage when he was a Member of Parliament. Europe has female imams and even one or two gay imams. This sort of thing will not be going down well with their traditionalists. While I have no disagreement with you about the state of Modern Europe, it is good to mourn when something beautiful is destroyed. Even though they were brought forth by a corrupt church, the Gothic Cathedrals are widely considered to be the Zenith of Western art. Having taken generations to complete and the reorganization of entire economies to construct - the results of the labor were a testament to man’s God given creativity and ingenuity - truly awe inspiring. Forests of stone made to appear lighter than air! Stained glass (the first truly Christian art form) that presented the average European with bright and luminous colors of the likes they had never seen or imagined before! Unless you are a Gnostic who despises all material things, the loss of one of these strustures is truly a tragedy. But how can we disentangle the beauty of Notre Dame from its origins and the use to which it was put by the Roman Catholic church? Its beauty was built on the destruction of souls (indulgences), and while it stood it was a beautiful mask for false doctrine and, as @jander said, sentimental Christianity. I think it was in Manetsch’s Calvin’s Company of Pastors in which it was written that the reformers destroyed the stained glass windows in the main churches in Geneva and left the sanctuary open to the elements for years. 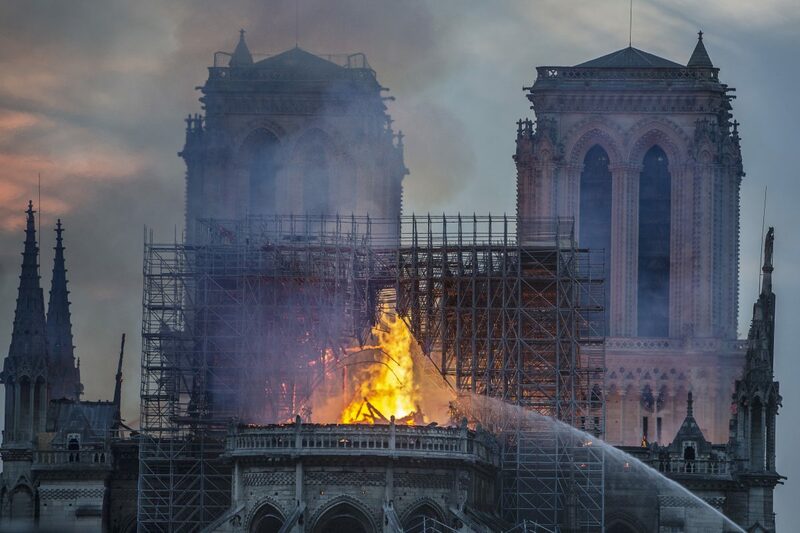 What’s bitter cold and birds in and out compared to idols in the sanctuary… I think our reformed fathers may have taken some delight in this week’s burning of Notre Dame. I feel able to side with everyone’s views here. I think there must be right and wrong ways to mourn and, dare I say it, celebrate this destruction. The destruction of the Tower of Babel was no tragedy. But, yes, how tragic that men would waste such talent. This cathedral represents everything that the western world wants Christianity to be – namely, a hollow shell, beautiful and benign, maintained for the sake of sentimentality, but irrelevant to our actual lives. So my response to this whole Notre Dame thing is basically… who cares? We can’t build footbridges. We can’t win wars. We can’t put men on the moon. The supposed high point of our culture are electronic gewgaws that will all be in a rubbish heap in 800 years. We brush the ashes of our smoldering churches off our own shoulders. Let us tremble, not laugh. But how can we disentangle the beauty of Notre Dame from its origins and the use to which it was put by the Roman Catholic church? Have you ever put up a Christmas Tree in your house? Hate to break it to you but they have pagan origins. Perhaps you think nothing of value was produced by Europe prior to the Reformation? The real question is if God can produce good/beauty from evil. I refer you to Gen 50:20 for the answer. The Cathedrals were primarily funded by the towns they were built in, not the Catholic Church. Many of the stained glass windows featured an attribution to the trade guild that had put up the funds for their construction. Let’s not cast aspersions on all of European-kind because of Rome. No doubt the Reformers would have celebrated - they were Iconoclasts. Stain glass windows in themselves are not evil. In fact, most of them illustrated biblical stories to a populace that was illiterate and didn’t own a single book. And they are amazingly beautiful. I know there were many building projects funded by indulgences (take the infamous “Butter Tower” for one), but was Notre Dame? I thought it was built much earlier than the hey-day of indulgences. Even though they were brought forth by a corrupt church, the Gothic Cathedrals are widely considered to be the Zenith of Western art. Having taken generations to complete and the reorganization of entire economies to construct - the results of the labor were a testament to man’s God given creativity and ingenuity - truly awe inspiring. Without a doubt, God has given great ingenuity to mankind. Mankind has certainly built many great and wonderful things that inspire awe to the senses. But I would submit to you that man’s ingenuity is not something worthy of celebration in and of itself. Rather, what makes man’s ingenuity praiseworthy or not depends entirely on what we’re doing with it. This may sound like a contradiction, but just because a thing is awe-inspiring and beautiful doesn’t make it praiseworthy. Some of the most amazing and wondrous things man has built have been entirely instruments of idolatry and evil. The Tower of Babel, the temple of Zeus, the pyramids, the ziggurats, the colosseum, etc. These may indeed testify to man’s ingenuity, but more than that, they are testaments to man’s rebellion. Shall we celebrate these things, simply because they are magnificient? Are we not at that point simply relishing in the glory of man? The issue is only gets worse when we start talking about “Christian” iconography. The fact that the cathedrals were brought forth by a corrupt church — as you rightly note — should not be glossed over so quickly. You seem to think that we can simply divorce the beauty of the cathedral from its false Christians origins. We cannot. Because the beautiful and magnificent thing, in its very essence, is an icon constructed to promote a false worship. Catholic cathedrals exist to venerate a heretical Mass. I am sure that many of the high places in Israel — erected for false worship — were truly amazing sites to behold. Should the kings of Judah have let them stand because of their magnificence, because they bore witness to man’s “ingenuity?” No. They were to tear them down. Because God isn’t interested in celebrating man’s ingenuity. He is interested in right worship. Rebuild it. Make it magnificent. And at the end of the day, the masses will look to it in awe, and marvel at the glory of man. The real question is if God can produce good/beauty from evil. Moral good and aesthetic beauty are NOT synonyms, and I think we should be careful how we join them together so we don’t equivocate. Any wicked culture can produce aesthetic beauty, and that beauty testifies to the glory of God in SOME sense. Hence my comment about Babylon. I’m sure it was legitimately beautiful in some ways. But what moral good did Notre Dame come out of? And what moral good (or what morally good doctrine) has it represented to the world? Sorry, but your question about Christmas trees (I like 'em) is a red herring, because I’m not arguing about whether or not we can make use of pagan things for a good purpose. I agree we can. The question about whether or not I think Europe produced anything of value prior to the Reformation (yup) is a non-sequitur. The word "value,” which you used in your reply to me above, is a good place to see the danger of equivocation. Why? Because the aesthetic value of Notre Dame seems clear (or at least we can agree for the sake of argument that it’s very high). But the moral value? The value to God’s people? That’s a different question and I think that’s the one at hand. I take your point. It isn’t my contention that the two are synonymous - my fault for phrasing it that way. You originally raised the question of whether or not Norte Dame’s beauty can be “disentangled” from its origins. I think the answer is clearly yes and that a piece of art should be viewed autonomously on its own merits. If you cannot make that distinction, then you would fit well with modern Cultural Marxists who insist on interpreting all art through partiarchy, racism, etc. So can one lament the loss of a great piece of art despite its pernicious origins? I say yes. If the Taj Mahal burnt down, or the Great Wall of China were razed to the ground tomorrow, I would feel the same level of lament. You seem to think that we can simply divorce the beauty of the cathedral from its false Christians origins. We cannot. We can. I needn’t know anything about an artist to evaluate whether the art he produces is of value or not. I’ve always found the music of Richard Strauss to be beautiful. The fact that I later learned he was a Nazi has no bearing on that earlier evaluation. It’s akin to how Paul views the eating of meat sacrificed to idols in 1 Corinthians 8. The meat is just meat. In this case the art is just art. Now there are of course other considerations to take - like whether or not such art would be tempting to “weaker” brothers - in the case of the Reformers, the iconoclasms may have been justified due to the circumstances that led to the Reformation, same with the kings in Judah you mentioned. I would contend that there was nothing inherently wrong in the “high places” themselves. They were just stones. As usual, well said @jander. Thanks for articulating your thoughts, brother. I know this passage is talking about something very specific. I can’t help but wonder, though, if we can’t draw some connection between Jesus’ response to this disciple’s admiration of temple aesthetics and our admiration of cathedral aesthetics today. Jesus doesn’t seem to have any concern for temple aesthetics in this passage. Do we think He has greater concern for cathedral aesthetics today?